Camping has been alive and well in the Northeast Illinois Council since 1910, when Evanston Scouts crossed the south end of Lake Michigan to explore the beautiful sand dunes of Western Michigan. Today, thousands of Boy Scouts camp in the Northwoods of Wisconsin at Ma-Ka-Ja-Wan Scout Reservation, one of the only Scouts camps with a horse ranch on the property. Closer to home, Camp Oakarro serves local Cub Scouts by providing nature exploration with Ranger Mike, and beautiful wetlands where many boys and girls catch their first fish. Between it all is Camp Sol R. Crown, our premier training facility, where Scouts, volunteers and adult leaders enjoy a variety of activities meant to support our outdoor program. Ma-Ka-Ja-Wan Scout Reservation (MSR) – Established in 1929, Ma-Ka-Ja-Wan Scout Reservation in Pearson, Wisconsin provides adventure on a whole new level. Located on over 1500 acres of rolling hills and lakes, MSR, as it is highly recognized by alumni, is a prized destination for Scouts from all over the Midwest and beyond. The Northeast Illinois Council supports its Boy Scout camp through generous donors including the Ma-Ka-Ja-Wan Alumni Association, Wilderness Engineering Society, and the Mark & Maureen Miller Family Foundation, which ensures that every Scout has the opportunity to attend our premier Scout camp. Visit makajawan.com for detailed information. Follow: Facebook.com/makajawan and Twitter.com/neicbsa – Our Ma-Ka-Ja-Wan staff will keep you posted with photos and news from camp. Camp Sol R. Crown (SRC) – Located near Wilmot, Wisconsin, Camp Crown has 146 acres of rolling hills and dunes with wooded and open areas, campsites and a heated training center. Year-round, weekend campouts provide a memorable experience for Scouts. Used for training, weekend activities, unit campouts, Camp-O-Rees, Webelos Woods, and winter camping events such as OKPIK and Klondike Derbies, Camp Sol R. Crown allows us to experience Scouting adventures a little closer to home. 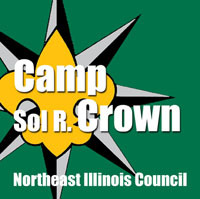 Follow: Facebook.com/neicbsa – Visit our main page for updates on events and activities at Camp Sol R. Crown. Camp Oakarro (OAK) – Located within our Council boundaries near Wadsworth, Illinois, this property boasts 40 acres of wooded land with two ponds, a large open field, campsites, and an enclosed Bair Family Pavilion. Providing sites for weekend camp-outs and other scouting events such as Special Needs Day, Tiger Safari, Scout Reach Day, and WEBELOS Woods, we keep the camp filled with the sounds of laughter and nature year-round. Follow: Facebook.com/NEICCampOakarro – Find out what Ranger Mike is up to and check out our latest service projects and nature photos.